This publication offers views on sustainability through six articles investigating a range of themes: co-branding and collective sustainability, blue growth and maritime spatial planning, the element of sustainability in healthcare, business sustainability in typical manufacturing domains and service domains, frontline employees in retail organizations, and exploration of private participation in water treatment and distribution business. The idea is to enhance the understanding of sustainable business operations in the contexts of two significantly distinctive cultures, namely Europe and Asia, by looking into businesses in Finland and India on a practical tune. 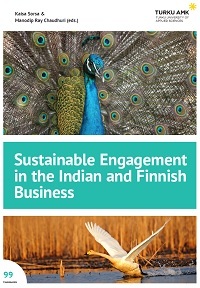 Sustainable Engagement in the Finnish and Indian Business is produced in the framework of a two-year project between India and Finland and funded by CIMO.